Combine milk, condensed milk, chocolate chips, heavy cream, and vanilla extract in a slow cooker. Cover and cook on Low, stirring occasionally, until chocolate chips are melted and mixture is smooth, about 2 hours. Easy, slow cooked classic brûlée! This is ridiculously good. I followed the instructions exactly with no modifications. Best hot chocolate I have ever had! I made this with whole milk, and it was incredibly rich. Delicious, but a half a mug and I was stuffed. Next time I'll use 1% or 2%. 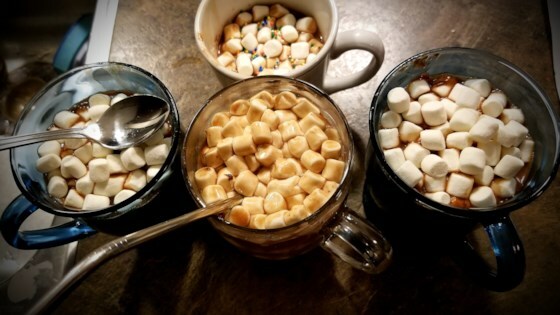 I'm not a huge hot cocoa fan but THIS.....oh my. It's amazing. We made the recipe x5 for the office and everyone raved. It's sinfully delicious. This is a wonderful recipe that has turned into a Christmas tradition for our family for the past 4 years. I followed recipe as written. Set out add ins and whipped cream. I made this for company potluck and it was a hit!! So rich and thick and yummy! !